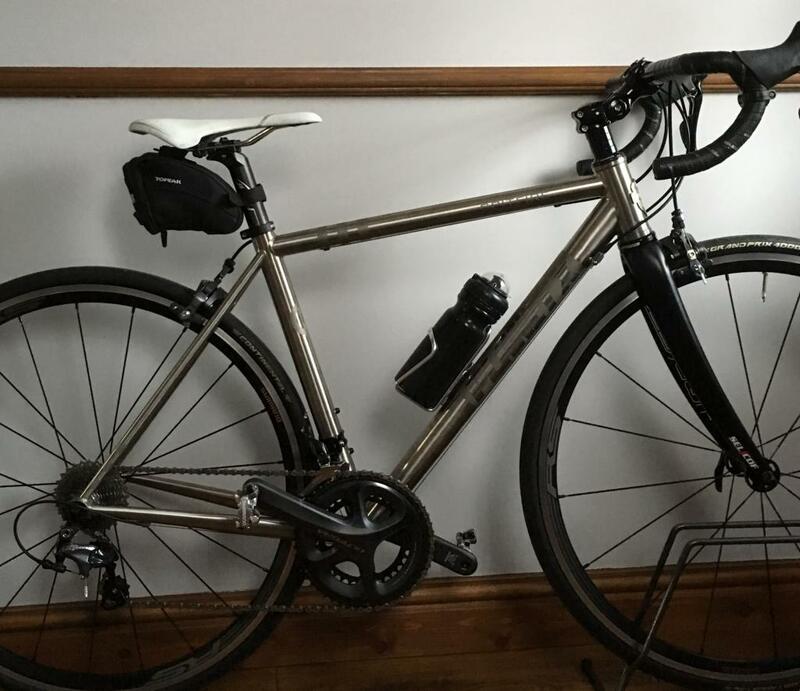 for years now since i can remember me and my bike have gone everywhere so when the tour came here and living in yorkshire it seemed natural to pedal it. for the first time reluctantly i went out and bought the bird seed energy chocolate flavoured energy bars, the energy gels that taste like they have been in nappies and the fizzy zero cal drinks high energy get you up them hills tablets that taste like alka seltzers. i went around the stage two from york to sheff on my bike.on a steady road bike i have to say. i ate a bananna two hours before, did the right warm ups etc and went around in about 8 and half hours, a couple of comfort stops. i felt like crap afterwards, sick dizzy and really really ill.
now i think some marketing company is having you lot on. that calorie free biscuit and extra whammo zammo drink is just expensive rubbish. its hyped up junk. nice bike comfy clothes and your off. take a selection box with you not those pretend chocolate flavoured bird seed biscuits the size of your thumb and those gels are just rubbish. get some proper food down you and get over them hills. Possibly the best post ever on road.cc. I agree entirely, all that science guff just makes you feel sickly. Fig rolls are my fuel of choice wherever possible, or if I stop mid ride I'm all about a rotisserie chicken where possible!! Aye, look at the Froome lad, all skin and bones, he needs to eat a few meat pies, he'd get up them mountains much faster if he did. And what's wrong with riding steel bikes with downtube shifters? While we're at it, fuel those riders with brandy and amphetamines, like our Tommy Simpson did. We are not all racers so why do some of us fuel ourselves like we are? If the point of non-competitive cycling is to enjoy the experience why not enjoy the part of the experience that requires you to fuel up? Eat normal enjoyable food. Have a pint of shandy - the darn stuff Radler is named after cyclists in Germany -, pie and chips, pot tea, slice of cake, and enjoy your riding. Chances are is you ain't a trained athlete with a trained athletes gut then eating gels and supping energy drinks and whatnot, if you ain't used to 'em, will just upset your stomach and spoil your day. Silly as it seems (what with eating energy bars and energy gels) you probably ran out of energy the first time round - and given your description of the symptoms you may have bonked. Add up the total calorific value in the two rides and I bet you'll see a huge difference. A full english is probably pushing a thousand calories, as is a fish and chip dinner with coke, bread, tea cake, crisps etc. A standard 51g Mars bar is 229 cal, so eating four of them is nearly another thousand. Looking at the High 5 stuff, energy gels are under 100 calories and energy bars are under 200, so your going to need to eat at least ten bars and ten gels for the same amount of calories. The gels and bars are meant as a *supplement* to give you instant energy for eg a touch climb. They are not meant to replace your basic calorie intake from normal food. Also the "zero cal drinks" are likely electolytes and are nothing to do with energy or getting you up hills, they are for replacing salt lost though sweat. I personally favour a strategy involving carb loading the night before, two breakfasts on the day, a pocket full of bite-size flapjack pieces, honey sandwiches and not forgetting several tea and cake stops. I've got an image in my head of soigneurs in the feed zone handing out parcels of fish n chips to the professional peloton. GCN should make a spoof video of this. Matt Stephens: "So tell us, what's in the Team Sky grease-proof musettes?" Sky Soigneur: "Well, er, fish n chips, mushy peas and a can of coke or maybe Fanta. Froomey likes curry sauce instead of peas, um, Vas Kiryienka prefers a special coz he's got a big engine. And Eddy Boss will have a battered sausage." It's salt n sauce for Chris Hoy and a deep fried mars bar for vegetarian Robert Millar. Do they still sell "John Bull's" in North East Lancashire? They would keep you going. Although I find it really difficult to eat anything more substantial on a ride than a sandwich. you have to laugh though. keep riding, smiling. and stay off them zero cal drinks, they will be the death of you. I rattled round an event on Arran the other week, done all that, only I skipped the lunch and had 7 pints between the end, the ferry and the train. Hic. "Those gels are just rubbish." They're not, you're just not using them properly. Or they don't suit your riding. Each to their own, gels work for me. If I ate all that every time I rode my bike I'd be a hell of alot slower and also probably have a coronary. I do stop for cake though, cake is good. While I generally agree that proper food is better, I find fish and chips are too heavy to digest while riding. Breakfast: Omelette on toast and a pint of tea . For the journey: A whole loaf of Soreen. Couple of Nature Valley bars. Two water bottles of squash. Ideally, stop en-route for cake and coffee. I reckon a pint of water and a washing-up bowl of porridge with sultanas before I set off, would keep me going for 81 miles. If the scientists could only make an energy bar smell or taste like fish and chips,now that would be a winner. + 1 for the nature valley. I couldn't ride on fish and chips and as a former runner i find gels pretty repulsive. Someone gave me a clif shot blok when I was all in at the end of a hot race and it may have been psychological but I'm sure it got me home. I prefer muesli before the ride and lots of it. did a 200 miler over 2 days at the weekend over yorkshire dales, fuelled by water, ale, cereal bars and chips. Tasted awsom, felt awsom. There's definitely something in the 'real food' argument -(though just fish and chips perhaps a bit too heavy) -I had my first proper bout of cramps and muscle spasms on a very long, hilly ride last month - cereal bars, gels, chocolate, isotonic drinks and hi five, caffeine etc and yet the lack of salt plus hard efforts over hills really screwed me up! I couldn't stomach any more gels or bloks/ sugary water and only got better after pork pies, peanuts, sandwiches and massage! All those little 6-for-£1 breakfast snack bars in the supermarket, plus malt loaf, fig rolls and bananas. Energy bars just taste like premium-priced cardboard. Electrolyte drinks though, are ace. If I don't get my fill of salts, the cramps and headache are awful. Although this can mean that I treat myself to crisps instead. Well as I understand it energy bars have very low fat, high carb/sugar. So you get plenty of carbs but no fat. Fish and chips is usually pretty fatty, though usually poly-unsaturated fat (unless done in beef dripping as you sometimes still find in Yorkshire). I think a reasonable balance of real food, bananas and organic bars isn't too bad. You missed out Berny Eisel's pizza. 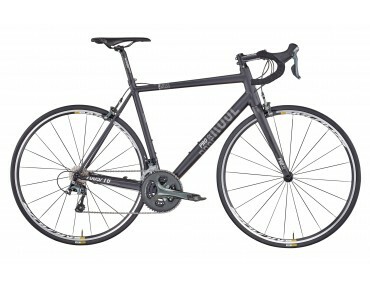 It's time to chop up those stupid carbon fibre bicycles. Last 100-miler I did included a lunch stop for fish & chips and a pint of cider. Probably one of the easiest I've done - solid, savoury food always wins over gels, and the cider was perfect for speedy glycogen replenishment. here is my little old bicycle. All I'm seeing is that a man rode for 7 odd hours on a banana, an energy bar and some gels, drank zero calorie "energy drinks" and then bonked. Go figure! 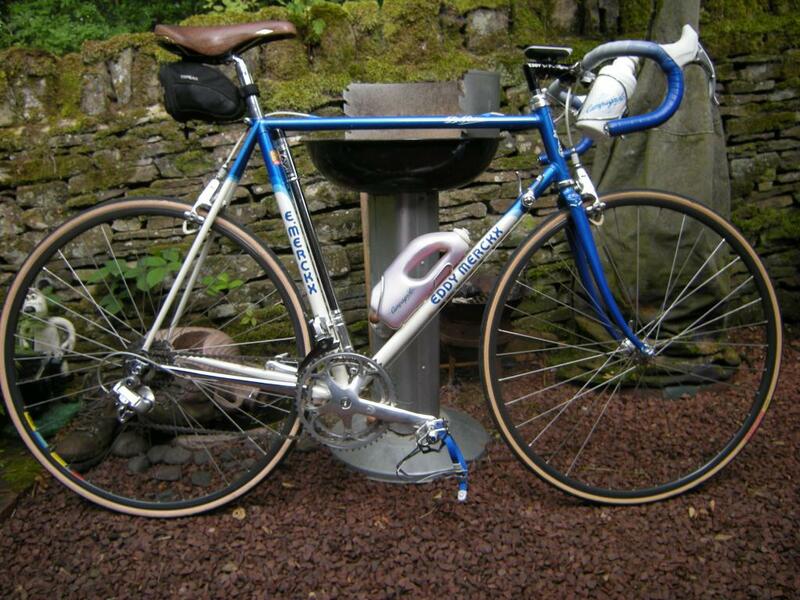 Love your Merckx though, Stanley. Lovely! Zero calorie drinks and tabs contain no energy, by definition. Obvs. Though the water and electrolytes might help you access stores of energy already in your body or help you digest other food better/quicker. I go with "real food" every time, but chips are usually a bit heavy. Beans on toast is good though. I like quiche too, but I guess it's not for everyone. And cake of course. And tea, lots of tea. If I need some instantaneous energy I'll have a bit of Kendal Mint Cake if I happen to have any on me, or chocolate or even nuts and raisins. Chocolate-coated coffee beans are good too.